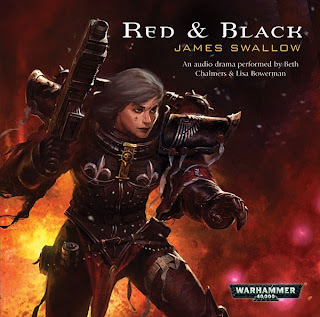 Lord of the Night reviews the Sisters of Battle audio-novel Red & Black by James Swallow, author of Faith and Fire and Hammer and Anvil in the Sisters of Battle series and the New York Times Best-Selling Author of Nemesis. The Sisters of Battle series continues with an audio-novel that gives us a short but enjoyable story with a complex moral dilemma that only the 41st millennium can give. Jim Swallow has written quite a good short story here, and the audio aspect only makes it better as you can feel the devotion of the Sisters, and the sadness that lies within the ending. Sister Miriya, a Celestian elite of the Sisters of Battle is called by her Prioris to examine a prisoner taken from the warp-stormed world of Hollos, now freed from its isolation. Miriya is given her mission, to evaluate Hollos and determine whether it must be welcomed back to the Imperium with joy and the bonds of faith, or whether the ultimate sanction is called for. With her squad, the Magos Biologis Questo Nolan and the Hollosian envoy Rho, Miriya travels into a world of mysteries and lies that refused to be answered. But the greatest mystery must be answered or Hollos will burn. Have the Hollosians kept their faith? The characters in the audio-novel are quite good. Sister Miriya and her squad provide the Ecclesiarchal view of the story, and Miriya proves surprisingly likeable for a Sister of Battle. Her devotion and faith are unquestionable, but she is willing to look at a situation and look for alternate solutions to simply burning the place down. Questo Nolan is not delved into deeply, though i’ll admit his voice-acting is simply fantastic, but his scene at the end shows that the most human of the group, is in fact the cyborg. The action of the novel is quite simple with some good combat scenes thrown in, but these are few as the audio-novel is mainly dedicated to the mystery of Hollos. The pacing is quite good as the audio-novel moves at an appropriate pace, the narration shifting from one scene to another at the right moments and providing the gravity and drama of the situation with vocal tones and background music. The voice-acting is quite good, Sister Mirya and Rho’s voices being fitting. However I felt it was Rho and Questo Nolan who had the best voices, Rho’s clearly showed her nature and at the end I felt her voice genuinely reflected her situation and the tragedy of the ending. And Nolan’s was very Mechanicus, deep, buzzing and machine-like, and the appropriate use of words and phrases of the Mechanicus only made him more believable. The ending is a sad one, reminding us that sacrifice is required for humanity to endure. And yet its always the innocent of the faithful who must pay the price while the warriors endure. Questo Nolan and Miriya provide an interesting question, is that sacrifice always worth it? I give Red & Black a 6.7/10, a solid story with some good moments and a tragic ending that really provokes some feeling in the listener. Its not the greatest audio-novel I’ve listened to, that is Throne of Lies, but it was enjoyable and perhaps i’ll listen to it again one day. Should you buy this novel? If you like the Sisters of Battle then yes you should. If you want a good audio-novel then I would say yes as well. But if your looking for a war-torn novel that oozes carnage, then this isn’t for you. 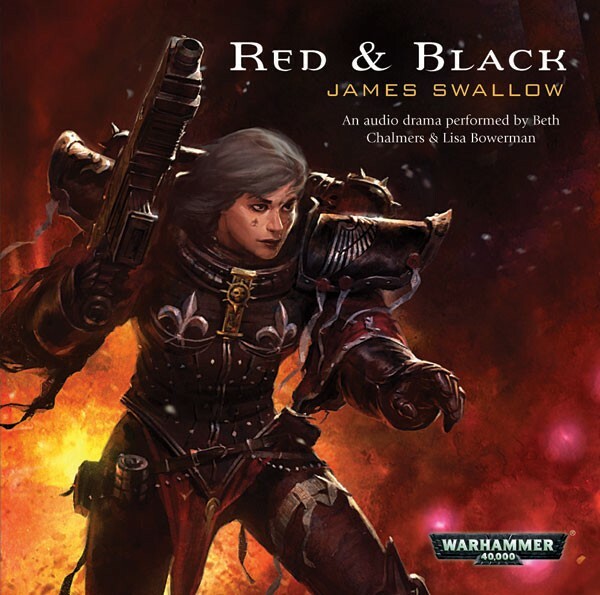 Red & Black is more of a mystery story than a battle one, and thus only listeners interested in mystery should consider purchasing this audio-novel.